So far everything is working out well and I’ve started 2018 positively with the attitude of ‘make do and mend!’ I’m using up everything that needs using up in the kitchen and looking for cheaper but healthy meals so the wartime recipes are quite useful! 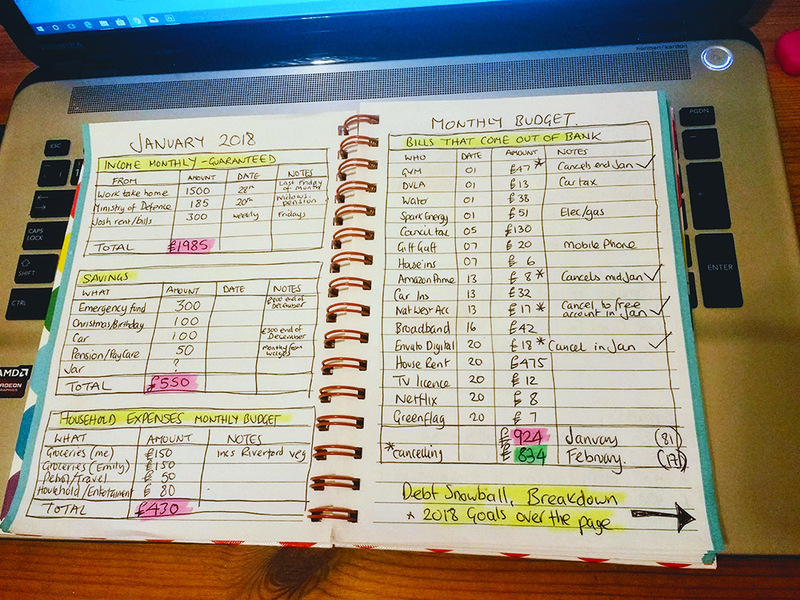 I worked out my complete budget and accounted for every single £1 coming in and going out and even made some observations on what I could cut back on to free up more money every month which will all help to clearing debt faster and saving money faster too. – I cancelled my gym and saved £47 per month. – I cancelled Amazon Prime (I already have Netflix) and saved £8 per month. – I cancelled Envato Elements and saved £18 per month. – And finally I realised that I was being charged £17 per month as I had the Platinum Select Account with Natwest. I initially got this bank account as it gave me free worldwide health insurance which was great because 2 years ago I was hospitalised in the USA with double pneumonia and hypoxia to my brain (oh and an asthmatic episode during a visit to the Grand Canyon) and NatWest covered my $20,000 hospital fees. But my ex-partner and I split up so I don’t travel anymore so the insurance is not needed. So I converted to the basic FREE select account. Just these 4 changes will free up an extra £90 in January which I’m thrilled about!!! Not only that I’ve straight away used that money to pay off two small debts to Utility Warehouse and Nottingham Council Tax! I’ve also been working out what other debts I have and although I have one credit card I only use it in an emergency and clear off immediately if it is used. However I do have student courses debts and over payment of child tax credits of larger amounts that need paying off so that’s what I hope to clear completely over the next 12-18 months. In addition tomorrow is my last day of my first full cash budget week for food, household items, petrol/car and entertainment. My total weekly budget for all was £55. I’ve spent £17.56p which means tomorrow night I WILL be putting £37.44p in my cash savings jar! As a single person there is definitely less of a safety net (and less income!) so to me living to a strict budget and doing without for a year is a small sacrifice I am willing to make to financially get ahead to a safer place… it will give me peace of mind. PS: I’ve been watching Dave Ramsey videos and sort of following his ‘baby steps’. The guy is a bit blunt and I may not agree with some of his personal views but I have to agree with his basic baby steps to get yourself out of debt and create an emergency fund. Good sound advice. It’s certainly keeping me motivated. This entry was posted in Back to Basics, frugal living. Bookmark the permalink. ← How cheaply could a person live on WW2 food rationing? You are amazing! I love to make a game out of saving. I still haven’t spent any money this year(except for rent and bills) and I wil be canceling two more services this week. Yay us! 41-1/2 years! I am disabled now, and have been for several years. After filing for Social Security Disability in November of 2012, I had my benefits approved by February of 2013!! They didn’t even blink, which was very rare for them to do, I understand from the stories so many others were and had been telling for years, about fighting for years for the benefits they seemed to qualify for under the rules set forth at the time. I don’t know if it was a coincidence, or if it was due to the (then) recent assignment of many more benefits applications processing agents as well as the “judges” who reviewed and made determinations on the thousands of appeals in backlogs; or the fact that I did my due diligence in researching all the qualifying conditions first, then confirming with my six doctors that they agreed that it was time for me to apply – all did, and most had been telling me to do it for ages, but I couldn’t stand the idea of giving up working and having my relative productive independence – that they would back me up when inquiries were made; or that I picked out an excellent law firm to represent me and submit the mountains of paperwork and forms on my behalf; or a combination of all those things, but whatever it was, it obviously worked. I have yet to come across anyone (besides those who had applied for and got automatic approval for certain chronic or soon to be fatal conditions) who applied for benefits due to acquired, or slowly advancing inherited conditions, that took away their abilities to continue their careers, who got it faster than four months. It was about the only thing I had go right in my personal life for several years! The benefits don’t come near to my former income as a Certified Surgical Technologist (ODP-Scrub to you), but, as they say, it’s better than a sharp stick in the eye! The expenses that I had when working, don’t come out of the bank account anymore of course, and were apparently more than I thought they were! I’m very grateful that I found you. I’ve been following you by rss feed. I am very pleased with your posts regarding your path for this year. I am trying to cut my budget to the bone so I can get some debt paid off. I think using your wartime recipes will help with both that and my struggle to lose weight. You are definitely not alone. I’ve decided that I need to get back into a habit of creating menus. You can’t find a more frugal protein source than pulses, especially if you buy them dry and take the time to soak and cook them yourself. For the bigger beans and chickpeas that require a long soaking time, I tend to soak and cook an entire bag at a time. Then I drain, rinse and freeze them. Then they can be used just as conveniently as the tinned variety – but at less cost. My weekly spend is £7.82, of which £3.27 was on essentials like milk, £1.50 was on foodstuffs for the dog and £3.55 on stuff that wasn’t essential, but will make mealtimes that little bit more interesting. It’s mostly reduced cheese from the little Tesco near work and there should be enough to last me the entire year! Tomorrow morning I need to buy a £4.40 daily bus ticket, as I don’t fancy a 7.5 mile walk home in the dark, and probably the rain, after a night shift. I will use it again later in the day, so I feel I can justify it. Actually, bus fares are my big struggle, a monthly ticket has just gone up by a whopping 20%, I’m still trying to spend what I did prior to the increase, but it requires military level planning and some not inconsiderable walking, which is not helped by the fact I have done my knee in! Anyway, my weekly spend should come in at £12.22. I also earned 67p cashback!! Since I didn’t buy anything out of the ordinary and 67p will buy a pint of milk, I’m not complaining. Good luck to everyone trying to budget for whatever reason. My portions ain’t small! I like a full plate. Just made 3 portions of bread and butter pudding to freeze, for days when I need comfort food. Also making a cheese pudding for my tea, which is humongous, so I am going to freeze a couple of portions of that too. A few cheese scones will also go into the freezer. I feel quite ‘zen’ and in control. I would like to recommend a different financial adviser. Gail vaz Oxlade. All of her information and advice is free on line. Following her advice moved us from deep debt with no savings to stable, secure and debt free in just 4 years. And we have been so for nearly 10 years. Her TV show ‘TIL DEBT DO US PART is fantastic. CERTAINLY NOT smirking here! Your plan from where I’m sitting is amazing, and sounds like something I should be doing – WE rather, including my husband of 41-1/2 years! I am disabled now, and have been for several years. After filing for Social Security Disability in November of 2012, I had my benefits approved by February of 2013!! The benefits don’t come near to my former income as a Certified Surgical Technologist (ODP-Scrub to you), but, as they say, it’s better than a sharp stick in the eye! The expenses that I had when working, don’t come out of the bank account anymore of course, and were apparently more than I thought they were! One car (of two autos and one pickup truck – nothing newer than my 2000 Mercury Sable LS Premium) has had the insurance premium reduced considerably by taking it off the high dollar plan, by reducing the mileage used from over 50 miles a day to under 50 miles per week! And other economies introduced by considerably reducing impromptu shopping trips, eliminating the fuel expense that was used to fuel 350+ miles per week of commuting distance! I just recently found your blog, and wanted to ask two questions, more of a comparative nature than anything. While reading your neatly laid-out plan for your budget, I noticed two items with which I am unfamiliar. What is a “Council tax” and what does it pay for? Seems quite a lot of money, comparatively speaking. And, do you really get charged to “License” your TV? What is that charge for? I’m not trying to be nosey, or overly inquisitive, but I have done a great deal of reading about regular life in Great Britain, and we are both great fans of what’s called “BritComs” on our public Broadcasting station, and many aspects I am vaguely familiar with, but these things I’ve not come across yet! Thank you so very much for reading through all this, and for your reply as well, should you choose to leave one. And if this shows up in addition to another similar post, I apologize for that! I was in the middle of proofreading that one, and accidentally hit the Post button, before I got very far done! I think this one is a bit better! Thanks again! I haven’t had a tv in about 12 years now, I honestly wouldn’t even know what to watch on catch up tv! I don’t have a computer or watch anything on my phone either, so I don’t pay a tv licence. That doesn’t stop the tv licencing people sending me regular threatening letters though. What is it with them? I don’t have a car either but the DVLA don’t keep threatening to take me to court. Carolyn- Thank you so much! I’m glad you enjoyed reading my comments! And THANK YOU for the clarifications on my questions! But, things like detached garages in the backyard, swimming pools (we don’t have), and so forth. For instance, we have 1 acre of land, and a 3 bedroom ranch house – that’s everything spread out on one floor, no stairs. We also have a large metal “pole barn” in our back yard, which I think is about 22’X28′ long, which has insulated, corrugated metal walls, a thick concrete floor, 220amp electricity and natural gas installed for a medium sized ceiling hanging gas-fired heater, flourescent lights, an air compressor for running my husband’s mechanics tools, a welder, built in tool cabinets and work benches, wood working equipment, such as band saw, drill press, compound miter saw, sanding equipment, and two standing older rolling tool boxes he has migrated into that garage from each time in the last 27 years he has bought new, bigger ones for his job as an automotive and light to medium sized truck and RV transmission mechanic. RV would be like your motorized caravans for vacation and travel use. He’s done quite well at his work, has acquired all that equipment and stuff mostly since we bought this house 27 years ago, and we are by no means, in any fashion even upper or “mid” middle class according to today’s statistics. But not low middle class either. Somewhere floating around the top of the lower one third? IDK really, and it doesn’t matter. And we’re still happy together, with our two grown children happy and successful, plus our daughter and her husband have blessed us with SIX grandchildren, and #7 coming in early June!! He’s VERY successful, and keeps his family in fine shape financially, so she doesn’t have to work as a nurse unless she wants to, which she does two nights a week at a local hospital. We’d been married eleven years before we took a vacation trip of any kind without kids, but we didn’t have any kids at all for the first three years we were married, so it’s really not quite as long as it sounds! One of the best bit of advice Gail vaz Oxlade offers is showing a person how much money they can realistically spend in a budget category. I never knew what was a sensible amount to pay for a car or rent or even for the day to day things such as groceries. We quickly found out that paying $800 a month for a car was definitely not in our price range. Gail gives you the percentages to work with and follow based on your NET income. For example if your net income is $4000 then housing should not exceed$1400, transportation $600, savings $400, debt $600 and Living Expenses $1000. By following this we easily learned to stay on budget. I passed on this information to many of our friends and they all found (like us) that this was the first time they had an actual dollar figure to work with for each budget category. Of course if you have no debt then you can put that 15% into one of the other categories and the same goes if you don’t use all of your 15% for transportation. Using the 35% figure for housing stopped us from making a huge mistake when we went shopping for a house. The bank was willing to give us a mortgage that would have left us house poor every month but by using Gail’s percentage figure we knew exactly what we could afford when adding in taxes, insurance etc. Wishing you a comfortable budget Carolyn. Me too! If only we had started saving for retirement when we first started working we would have been able to retire and go on to doing something else 10 years early. My parents did everything right with their finances and I wish I had followed their advice and behaviours. Oh well – never too late. Retirement savings would be part of savings. The amount of 10% for savings (retirement, emergency, education etc) is really just a start. We started with just 5% as we were determined to pay off our debt as fast as possible and then increased once we were debt free and when and if we earned more. Of course we had to put a lot more in just to play catch-up so for quite a few years we ended up putting 20% into savings (no debt gave us 15% extra) and the additional 5% into paying down the mortgage faster. Another one of Gail’s TV shows was PRINCESS which is a series that all young people should watch as it focuses on women and men who live extravagant lifestyles as young adults and how this can destroy your future. Watching these shows would probably have helped us to live more sensibly. I have passed on the pricing that you did for living on WW2 rations to several of my friends and we all will try to follow this as closely as possible and see how much we can save. I learned when following my weight loss plan about 12 years ago that proportion sizes not only made a difference to my weight but a big difference to our budget.